"The articles on this page are reproduced with kind permission from the National Gem and Jewellery Authority of Sri Lanka"
"An event not to be missed"
One of the worlds most reputed sources for fabulous coloured gemstones,Sri Lanka will showcase her rare and beautiful sapphires together with a host of other gemstone varieties and magnificent jewellery at the facets Sri Lanka 2007 international gem and jewellery show 30th August to 2nd September 2007. Held annually in Colombo since 1991,FACETS Sri Lanka 2007,17th International Gem and Jewellery Show will have hundreds of local and foreign exhibitors showing their fabulous products and thousands of influential trade visitors from around the world picking up the best deals available in the industry.FACETS Sri Lanka 2007 promises to be bigger and better than ever before. Giving the FACETS Sri Lanka show an international flavor are the miners, manufacturers and wholesalers from around the globe including those from major source countries such as Madagascar,Burma,Brazil and Australia who regular exhibit their stunning products at the show. Visitors to FACETS Sri Lanka can expect to find a fantastic array of coloured gemstones on sale ranging from cornflower blue sapphires, padparadschas, star sapphires, rubies, alexandrites, cats eye chrysoberyls, aquamarines, tourmalines, topazes, spinels, zircons and moonstones to name just a few of the gemstone varieties that will be on offer at the show. Visitors can also look forward to feast of fine jewellery manufacture to the highest standards ranging from 18k white or yellow gold jewellery set with sapphire and diamonds in the latest designs to traditional 22k gold jewellery and trend setting silver jewellery. We look forward to welcoming you to FACETS Sri Lanka 2007,at the BMICH Exhibition and Convention Centre. "From Gem Talk December 2007-Reproduced with permission from NGJA"
Heralding in September this year and as always was Sri Lanka's prestigious gem and jewellery show "FACETS Sri Lanka 2007" which took place from the 31st of August to 2nd of September at the Exhibition centre of the Bandaranaike Memorial International Conference Hall (BMICH).This years visitors was no second to any of the other 16 previous shows.In fact it had a remarkable 20% increase in visitors than last year. Of the seven thousand five hundred visitors this year there was slightly over seven hundred foreign visitors and buyers. It was an achievement the organization was proud of .Yet another noteworthy feature was the increase number of Sri Lankan visitors who took time to come and left the BMICH pleased as "punch" with the satisfaction that even they were able to purchase something small and within the reach of their budgets. The BMICH exhibition centre has housed FACETS Sri Lanka for the past three years, this year there were over 150 participants which housed around 35 foreign companies. This year too competitions were held for the best gem cutters and also the best constructed booth at the show. The results were as follows:Messrs Ceyital Jewels of the Sifani group was adjudged the best booth withA.M.A. Careems a close runner up. The best Creative gem cutter award went to Mr W. A Karunadasa and the best standard cutter to Mr V.S. Rohana Siriwardena. This years chief guest at the opening ceremony was Hon Dr Sarath Amunugama and the other three distinguished guests of honour were Hon.Prof G.L. Peiris, the Hon Mano Wijeratne and Mr Edward W.Boehm the Vice President of International Coloured Stone Association of USA(ICA). Dr Amunugama in his address spoke of the industry as one with true potential and the natural advantage for centuries and he saw potential for it to turn out to be a billion dollar industry.He said presently we earn half a billion dollars from the gem and jewellery industry of which half of it comes from the diamond cutting industry. Prof G.L.Peiris stressed the need for value addition and state of the art scientific technology ,calibration and valuation to support the industry in order to make our products no second to the best available worldwide. Mr Edward Boehm delivered a most informative address supported with a power point presentation,on how we should set about acheiving those levels of international excellence in the field of gems and jewellery. By popular demand the show time had to be extended on all four days which gives food for thought for a bigger and better FACETS Sri Lanka 2008,which is scheduled to take place from the 6th through 9th of September 2008,at the at the same location but surely for longer hours each day! The Singapore International Jewellery Show is proud to have Sri Lanka as their country partner.Also known as "Treasure Island".Sri Lanka will divulge how their treasures sparkles as they exhibit their precious stones and beautifully handcrafted jewellery during the event. Situated next to the Central Business District,Suntec Singapore is at the heart of a self contained ,totally integrated events infrastructure,and only 20 minutes from Changi International Airport,where most Asian capital cities are within a six hour radius flying time. Held on 28th and 29th of May 2007 at the California Market Center-Los Angeles,California where Gem and Jewellery sector was coordinated by NGJA. 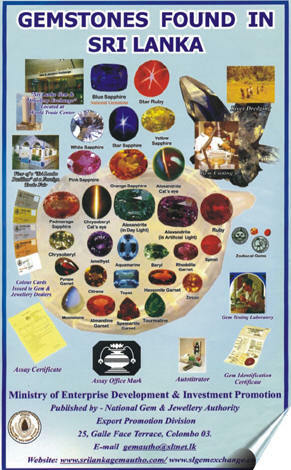 b)Colour Poster Titled "Gem Stones found in Sri Lanka" in Sinhala,Tamil and English). d)Booklet titled "Trade Fair and Exibition Guide 2007"
a)Gem and Gem Deposits of Sri Lanka by Herbert Gunaratne and C B Dissanayake.